Combining the best aspects of a wallet and a handbag, the Big Skinny Panther clutch wallet can hold 40 credit cards, a stack of cash, check book, compact camera or cell phone, keys and much more. This very scalable clutch flexes to accommodate whatever you pack, yet manages to stay sleek. 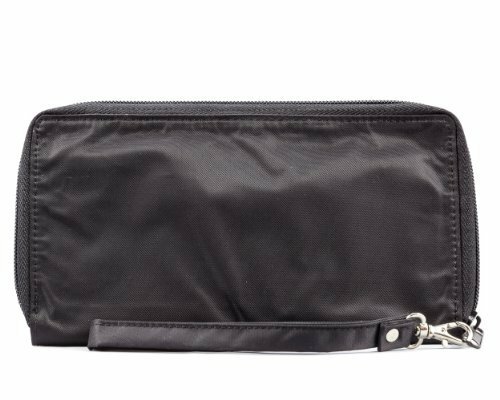 It features two general billfold/checkbook areas, two extra wide gusseted storage areas, six credit card pockets, two ID pockets with clear plastic windows for easy access to your driver's license or work badge, large interior zippered coin pocket and a detachable 9-1/4-inch strap. Big Skinny's "divide-and-conquer" design breaks up your cards into four discrete areas so they don't all clump together in one lumpy row. The extra-wide pockets are lined with a rubbery coating to prevent cards from slipping out. Designed with rounded corners for comfort, it's constructed of a lightweight, water resistant nylon microfiber material that is 5 to 7 times thinner and lighter than leather. It's machine washable for easy care and it dries out in about 20 minutes. The Panther wallet measures 7-1/2 x 4-1/2 Inch (and 7 mm thin when empty). The first Big Skinny wallet was designed by Kiril Stefan Alexandrov (the company's founder) because he loathed sitting on a thick, heavy leather wallet. Since creating the original Sport Wallet in 2005 using an advanced nylon micro-fiber material (5 to 7 times thinner than leather), Big Skinny has added dozens of slim wallet styles for men and women. If you have any questions about this product by Big Skinny, contact us by completing and submitting the form below. If you are looking for a specif part number, please include it with your message.